Apple's newly released Podcasts application for iOS brings one feature that some users have requested since the iTunes Store first came to iOS: the ability to subscribe to podcasts and also have them automatically download. Apple's official Podcasts app debuted on Tuesday in the App Store as a free download. Much like Apple previously split music and videos into separate applications, Podcasts for iOS gives downloadable Internet programming its own standalone space, separating it from the iTunes application. With the new software, users are now presented with a new "Subscribe" link when they access a specific podcast. Subscribing to a podcast through Apple's new Podcasts application will update with newly added content when it's available. 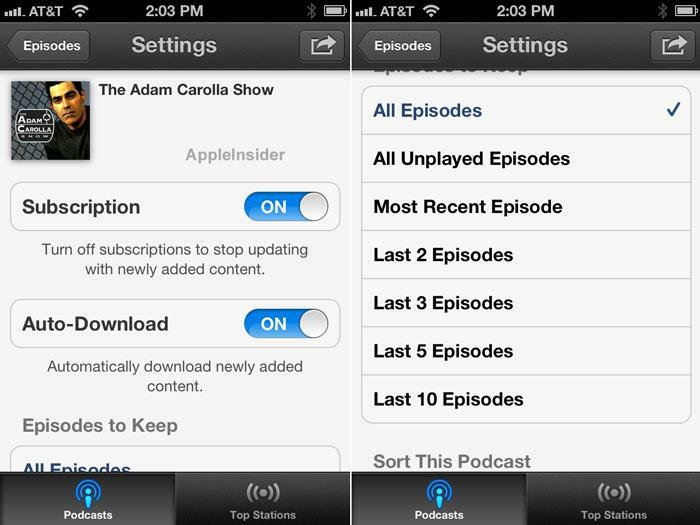 Subscribing to a podcast also gives users the ability to turn on the "Auto-Download" functionality. Once this is enabled, users can choose how many episodes to keep, including "All Episodes," "All Unplayed Episodes," "Most Recent Episode," or up to the last 10 episodes. Podcasts can also be sorted from newest to oldest or vice versa, and Apple also includes the option to mark all episodes as either played or unplayed. The Podcasts application for iOS also includes the ability to share shows or specific episodes with other users via e-mail, Twitter or text message. Presumably with the launch of iOS 6 this fall, Facebook integration will also become part of the Podcasts application. To search for podcasts, users tap the "Catalog" button in the upper left. This rotates the screen in the same manner that the digital bookshelf in Apple's iBooks application pulls up the iBookstore. 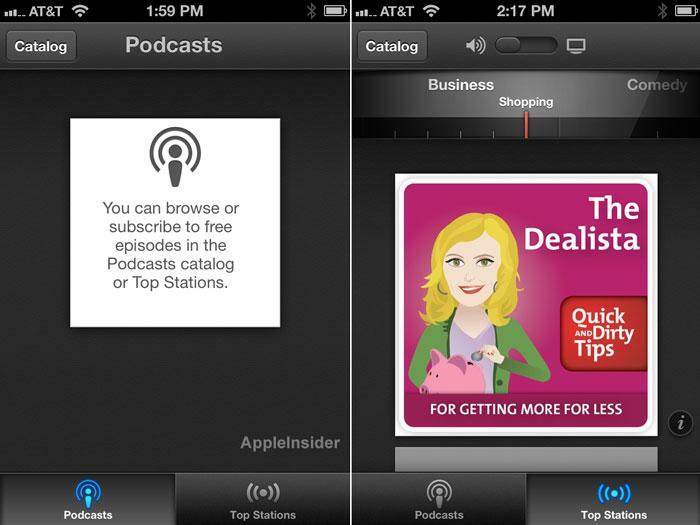 Once users access the podcast store, they are presented with an interface similar to the iTunes Store application found natively in iOS. There are three sections available to choose: "Featured," "Top Charts" and "Search." A tap of the "Library" button in the top right returns users to the main screen. Another new feature is the "Top Stations" section found in the library portion of the Podcasts application. Here, a unique user interface in the style of a radio dial allows users to browse and discover podcasts in different categories. Rotating the dial left to right brings up categories in alphabetical order, including "Arts," "Business" and "Comedy." Each of these categories can have a subcategory listed under it. For example, "Business" includes "Business News," "Investing," "Management & Marketing," and "Shopping." Once a category and subcategory have been selected, the top station for that category is presented on the screen with a large logo. 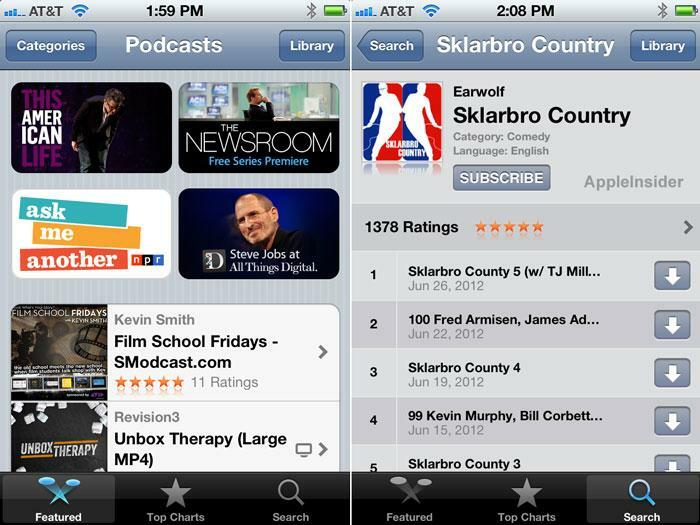 Users can then scroll downward to view the logos for podcasts in this category and discover new content. Users are now also given the option to either stream an episode over Wi-Fi or a cellular data connection, or download and save the episode to have access to it when a connection may not be available. Podcasts also features a sleep timer that will automatically stop playing a podcast while listening in bed, and users can also optionally sync episodes from iTunes on a Mac or PC. Another great feature of the new Podcasts application is syncing of episode playback progress. This means users can pause a podcast on their iPhone, and pick up right where they left off later on their iPad. One issue exists in the transition of podcasts away from the iOS "Music" application: The "Get More Episodes" link in the "Music" application still opens the iTunes app rather than Podcasts. Episodes downloaded through the Podcasts application still show up in the "Podcasts" section of the native Music app as well, allowing them to be played from either the Music app or the Podcasts app. At first blush, the new functionality and discoverability offered by Apple's Podcasts application for iOS appears to make it a very worthwhile addition.